Allegro™ elastic attachment nozzles from Nordson® Corporation (Nasdaq: NDSN) uniformly apply hot melt adhesive to elastic strands using a novel air-assisted contact coating technology for precise adhesive deposition. Concentrated delivery of hot melt adhesive to individual elastic strands enhances bond integrity for improved creep resistance. 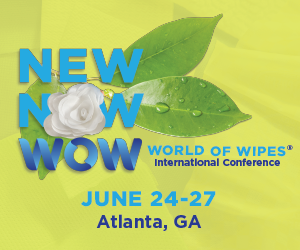 Applications for single or multi-strand attachment include elasticized legs, leg cuffs and waistbands on disposable nonwovens infant diapers, training pants and adult incontinence products. Patent-pending Allegro nozzles accommodate high-speed production, speeds up to 650 meters per minute, while supporting elastic centers as close as two millimeters. 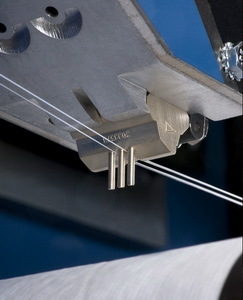 Integral strand guides stabilize strand position and post adhesive-application process air forms adhesive around each individual elastic strand. Exceptionally-low coating variability is achieved and add-on rates as low as 0.025 grams per coated meter optimize adhesive efficiency and maximize product performance. The robust design and all-steel construction deliver exceptional durability and resistance to the wear associated with high-speed elastic handling, as well as simplify cleaning and maintenance. And, Allegro nozzles offer a wide operating window, across a variety of process conditions as well as a broad range of elastic and adhesive materials. Allegro elastic attachment nozzles are compatible with Nordson Universal™ modules. In addition to standard nozzle configurations, special nozzle strand configurations and nozzle lengths up to 175 mm for many-strand applications may be ordered. For more information on the Allegro elastic attachment nozzles, contact Nordson Corporation at (800) 683-2314 or visit www.nordson.com/nonwovens. Nordson Corporation delivers precision technology solutions that help customers increase speed, productivity and up-time, enable new products and features, and decrease material usage. The company engineers, manufactures and markets differentiated products and systems used for dispensing adhesives, coatings, sealants, biomaterials and other materials, fluid management, testing and inspection, and UV curing and surface plasma treatment, all supported by application expertise and direct global sales and service. Nordson serves a wide variety of consumer non-durable, durable and technology end markets including packaging, nonwovens, electronics, medical, appliances, energy, transportation, building and construction, and general product assembly and finishing. Founded in 1954 and headquartered in Westlake, Ohio, the company has operations and support offices in more than 30 countries. Visit Nordson at www.nordson.com, twitter.com/Nordson_Corp, or Facebook.com/Nordson.